LinkedIn is described as the professional networking platform for social media. It is certainly not a place solely inhabited by recruitment agencies and job hunters. Social Media Examiner’s annual social media report (2017) states that 79% of B2B marketers use LinkedIn. In the past year I have been spending time engaging on LinkedIn, and building up my network. As a result, I have brought in new sales, new speaking engagements and connected with social media experts from all over the UK. I can say that directly networking with my London connections led to my #SheMeansBusiness training at Facebook and also provided me with connections for my podcast and my recent online summit. 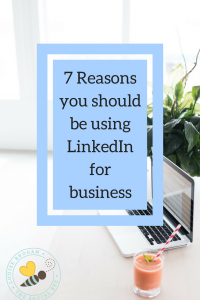 So why should entrepreneurs start to seriously consider using LinkedIn? You can publish your own articles on LinkedIn, and using the right keywords, get your business in front of your ideal customers. Repurposing your content. If you currently write a blog, you can also repost your blog onto LinkedIn pulse, to reach a new audience. Content Marketing Institute and MarketingProfs study from 2014 revealed that marketers cited LinkedIn as being the most effective channel for content distribution, ranking ahead of Twitter, Facebook and Google+. Posting regular content on LinkedIn, commenting on relevant articles and sharing updates keeps your business and brand in front of your potential leads. Having a profile on LinkedIn, you can put exactly what you want your network and potential clients to know about you. Want to focus on your skills in negotiating? Put that in your summary. Looking for new opportunities? Include that in your headline. You control what you want to share with your network. You can send connection requests to the top influencers in your industry. By adding in a personal note on how you know them, or how they inspire you, most will add you as a connection. Then by commenting on their content, you will start to grow your own network as a result. LinkedIn is the place to start conversations. In my recent posts, I was reaching approximately 300-350 people with my posts about my local events. When I asked a question about whether people attended local events in the summer, I reached over 2500 people. We all like to put forward our opinion and LinkedIn is the place to start and join conversations with our peers and our potential customers. All of these are reasons to use LinkedIn. But where do you start? I am running a LinkedIn practical hands-on workshop on 26th June in Mallusk Enterprise Park. I will be focusing on optimising your profile and looking at how to make connections that will lead to business growth. I will also teach you how, what and when to post, and how to use LinkedIn to bring you leads and sales. There are only a small number of spaces for this workshop as I really want to help each person who is attending. You must bring your laptop with you. If you can’t make it, contact me to work 1-2-1 and let’s start connecting!